Left to right, Paul McCartney, John Lennon, Ringo Starr and George Harrison. Frenzied Beatles fans watching the band perform in Manchester, in November 1963. The Beatles perform on the CBS "Ed Sullivan Show" in New York Feb. 9th, 1964. John Lennon in the Bahamas during the filming of Help! The Beatles on the steps of the plane before leaving London Airport for Paris at the start of the Continental tour which will include France, Italy, and Spain. 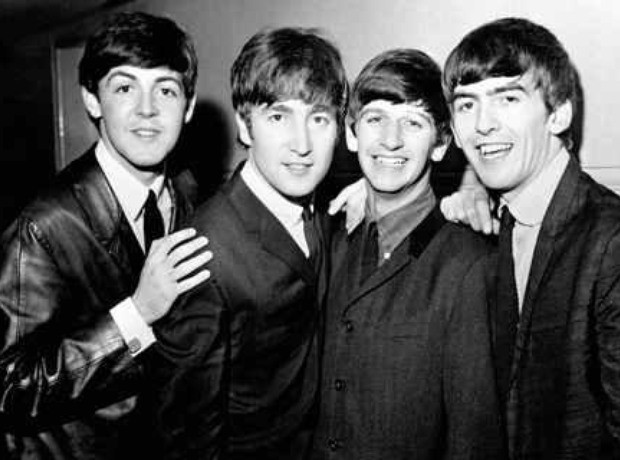 The Beatles showing their MBE Insignias after receiving them from the Queen. Boxer Cassius Clay clowns with the Beatles at his training camp Tuesday, February 18, 1964, just a few days before a world title fight.